If you’ve traveled to developing countries or off-the-beaten-path destinations, or you’ve seen some of these places on the news or in documentaries, you may have noticed that a good percentage of the population is wearing clothing that looks like it could have been purchased at a suburban mall some years ago. That’s no coincidence. Chances are, those folks are wearing second-hand clothing that was originally sold for and worn in North America or Europe. 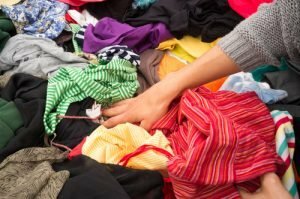 If you were ever curious what happens to the clothing that you donate to a thrift store or charity donation bin after wearing it long enough, read on to discover the journey of Mixed Rags. Indeed, the market for second-hand clothing and used textiles is great. But it might be wrong to call it a single market. Rather we’re looking at a series of interconnected markets. Depending on the condition of the items as well as the brand and design, these used garments will fetch a range of prices. That’s why we categorize them separately. 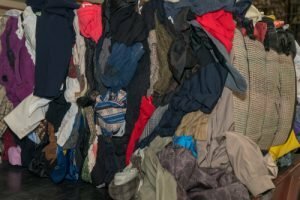 There’s a select handful of used clothing that falls into the “Vintage” column. That has the highest value, and often ends up in specialty stores in industrialized countries where demand for certain niche vintage clothing is quite high. Our sister company, Beyond Retro, is one such vintage clothing retailer, selling high-end used and vintage clothing in the UK and Sweden, much of which having been reclaimed or repurposed for second (or third) life wear. After that comes Credential Clothing. These are the kind of items that end up in thrift stores – and selling well there – as they represent unopened bags or boxes that often contain prized vintage clothing and other items of value. Bank & Vogue plays a hand in this line as well, buying credential clothing as well as running logistics for the purchase of wholesale credential clothing from charitable organizations and other collectors in the USA and Canada. In the wholesale used clothing business those are, admittedly, the sexier aspects. Vintage and Credential are easier sells. They fetch a higher price tag and generally fly off the shelf quite rapidly. But what happens when used clothing and other items don’t sell (or can’t be sold) at thrift stores? Our suppliers in the thrift store business talk about the necessity for high turnover in their establishments, due to rent and other overhead. Sitting on a big inventory of used clothing and other goods that may or may not sell is simple not practical. Once upon a time, that might have meant tons (literally) of clothing being sent to landfill. But landfill is a bad option, for a multitude of reasons. Land itself is a limited commodity. “They’re not making any more of it,” your father might have told you. Materials that go into landfill not only take up space, they begin to leech chemicals and toxins that can get into the air and water systems in nearby communities. 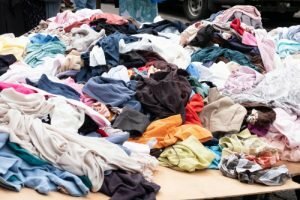 And not reusing or recycling clothing means that more resources are wasted and more waste is created – a vicious circle if there ever was one. Also referred to as “institutional mixed rags” or “institutional clothing,” mixed rags refers to clothing that is used, deemed unsellable in thrift stores, baled in bulk and shipped usually overseas. Without mixed rags, over four billion (4 billion!) pounds would end up in landfall each year. What happens to these mixed rags, anyway? Do they all end up literally as rags, used for wiping surfaces? Well, some in fact do become rags in their next life (usually the last life before recycling or disposal). A large percentage of these used mixed rags, however, are perfectly wearable clothes in good condition. That means they have a value on secondary and tertiary markets worldwide. Much of it can be sold in countries in Africa, Asia, South America and elsewhere. Some of it might be given away for humanitarian purposes. Bank & Vogue participates in what’s called the Circular Economy, involved in the purchase, sale and global logistics of mixed rags. By keeping these items away from landfill, we’re doing our part to help create a sustainable future for generations to come on this planet of ours. We’re always on the lookout for new markets and new partners in Mixed Rags. If that’s you – be it as a thrift store, distributor or shipper – contact us today to find out how we can work together.